Castlebar - County Mayo - Climate Justice for all – what can we do? In Copenhagen this week, the United Nations hosts a two-week long conference on the global threat of climate change. World leaders will meet to agree a crucial new global treaty on climate change. The decisions they make will shape all our futures and Ireland and the EU need to work for a global deal that truly tackles the causes and effects of climate change, before it’s too late. 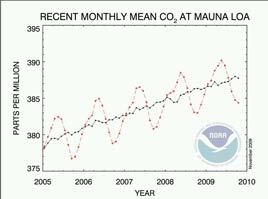 The level of CO2 in the atmosphere hasn't been seen for 500,000 years. Seasonal fluctuations overlay a rising trend driven by fossil fuel consumption. Climate change affects us all, the floods here in Ireland in recent weeks, a stark reminder. But we mustn’t forget the impact that climate change is having on developing countries, who are hit hardest but doing least to cause it. In Copenhagen, we need a strong fair deal, which offers support to poorer countries, who shouldn’t be forced to sacrifice badly needed health or education services in order to pay for a problem which richer countries have created. Climate justice for all! Many NGOs and groups throughout the world are organising events and demonstrations to demand real action on climate change in the build up to Copenhagen. Last Saturday, for example, thousands of people from all walks of life came together and created a giant human wave through the streets of Dublin, Belfast, Paris, Berlin, Brussels, London, Glasgow, Belfast and Copenhagen! Mayo Intercultural Action (MIA) is calling on people here in Mayo to take action and to come along to a lunchtime lecture followed by a tree planting ceremony, we are organising, in the GMIT, Castlebar on Friday, 11 December next at 1:15 pm. Renowned economist and environmentalist, Richard Douthwaite, will speak about the global threat of climate change and the challenges we face here in our local communities and globally, with particular reference to the discussions taking place in Copenhagen. This is an ideal opportunity to gain more information, ask questions and discuss this important issue. Richard, who lives in Westport, Co. Mayo, is an economist and writer. His best-known book, The Growth Illusion: How Economic Growth Enriched the Few, Impoverished the Many and Endangered the Planet explores the effects that the pursuit of growth has had on the environment and society. He is a co-founder of Feasta, the Foundation for the Economics of Sustainability, the Dublin-based international network of people who believe that the world's sustainability problems are due to the use of dysfunctional systems and are trying to develop better ones. His current projects include the design and introduction of a non-debt currency to run in parallel with the euro and the management of the Carbon Cycles and Sinks Network which explores ways in which land-based greenhouse gas emissions can be reduced. Look forward to seeing you at lunchtime on Friday 11th next. Fáilte roimh chách! For more information, contact MIA at 094 904 4511 or miamayo@eircom.net.